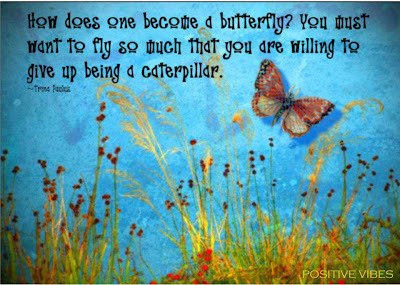 Ascending Butterfly: Motivation Monday: Are you willing to give up being a caterpillar Edition + We have a winner! Motivation Monday: Are you willing to give up being a caterpillar Edition + We have a winner! Sometimes we really do have to shed the skin that is comfortable and venture straight into the unknown to make the significant changes we seek in our lives to feel fulfilled. It's hard to give up what we know, why? But Ascending to a new level is a part of our journey, one we are not always pysched about, but often times it's just plain necessary. We learn how strong we are only at times we are challenged, only during the moments of growth that aren't always so willing to embrace. So instead of change forcing itself upon you, embrace it yourself and make small changes each day so that when your moment comes to give up being a caterpillar, you will be ready! Being an Ascending Butterfly means always being on a journey to rise higher than you were before. Don't forget to get in your entry for a $100 shopping spree to In Bloom, this giveaway closes soon and you've got to be in it to win it! I've always face any new experience with a sense a humor and faith that all will turn out well.so heck yeh : this caterpillar is not afraid to be a Butterfly !! Congrats on your win hope you enjoy your cruise Milena B. ! Thanks for this... I have butterflies on my blog again and thought of you. Thanks for the motivation! I definitely needed a little boost this Monday, and it's good to remember that there's a difference between being comfortable in one's own skin and being too comfortable in one's circumstances.